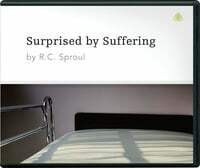 In Surprised by Suffering, Dr. R.C. Sproul addresses the most difficult struggle in human experience: the problem of pain. He demonstrates that God is involved in our suffering and does not leave or forsake us. Even in times of great suffering we can have a peace that passes all understanding. Dr. Sproul reminds us that the time is coming when the full blessings of Christ’s kingdom will be ours — and our suffering will be finished forever. Offer valid through September 29th. Donate Now.